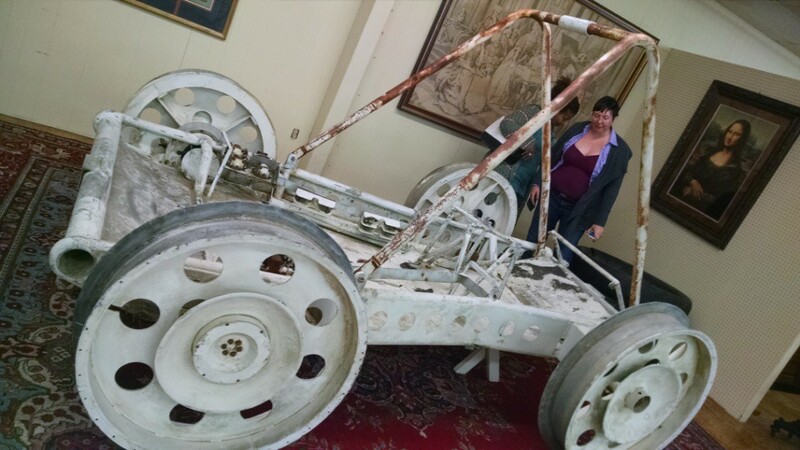 When last seen in November 2015, this NASA prototype lunar rover had just gone unsold at an Alabama auction house because bidders did not meet the (unstated) reserve price. Dawn Sabados, who wrote File 770’s post, now reports the rover is going to auction once again. RR Auction, a Boston firm, will have the rover up for bid on April 21. The firm says its authenticity has been verified by former NASA engineer Otha H. Vaughan, Jr., “who worked on the team of famous German-American rocket scientist Wernher von Braun.” The minimum bid is $25,000, but that was the minimum last time, so who knows? An original mid-1960s lunar rover prototype, or Local Scientific Survey Module, developed for NASA by Brown Engineering and known as the ‘Brown LSSM.’ Development of the prototype took place in 1965–1966, and it was used for lunar rover mobility tests and to conduct human factors studies and mobility evaluations. This vehicle was actually driven by the great rocket scientist Wernher von Braun and he can be seen with it in photographs. Otha Vaughan, a member of von Braun’s team, has examined the vehicle and identified it as authentic. It had been disposed of and long ago ended up in the hands of by a scrap metal dealer, who preserved it in his scrapyard. The rediscovery of this ‘lost lunar rover’ was the subject of several news stories in late October 2015. Accompanied by a letter of authenticity signed by Otha Vaughan and Johnny Worley of Worley Brothers Iron & Metal, in part: “This letter of authenticity is for the artifact known as ‘Brown LSSM,’ the Prototype Local Scientific Survey Module, also referenced in some historical literature as Lunar Scientific Survey Module. ‘Brown LSSM’ is a mobility test article developed by Brown Engineering…This LSSM prototype represents an important step in the design and engineering of the final rovers utilized during the Apollo Space Program. Otha H. Vaughan, Jr., of Huntsville, AL, who worked as aeronautical research engineer on the German-American rocket team headed by Wernher von Braun…positively and firmly identifies the pictured LSSM as the authentic Brown LSSM after carefully inspecting and measuring the artifact. Mr. Vaughn states that the team actually flew the prototype on NASA’s KC-135 Zero G aircraft ‘to get some idea of how she would bounce with rubber tires and things like that.’ Mr. Vaughan retired from NASA MSFC on January 1, 1999, after 45 years of ABMA and NASA civil service…. This entry was posted in Heard Online and tagged Dawn Sabados, NASA by Mike Glyer. Bookmark the permalink.